Watch: President Trump, Kim Jong Un express optimism following historic sit-down in Singapore, head to signing ceremony. President Donald Trump and North Korea’s Kim Jong Un expressed optimism following their historic face-to-face meeting at the Capella Hotel in Sentosa, Singapore. After the first such meeting of a sitting American president with a North Korean leader, President Trump said he would be going to a “signing” with Kim, but declined to provide details on the content of the agreement. According to a report by CNN Tuesday morning, the President and the North Korean leader have agreed to sign an agreement acknowledging the progress of talks between the two countries, and vowing to keep the momentum going, a US official said. 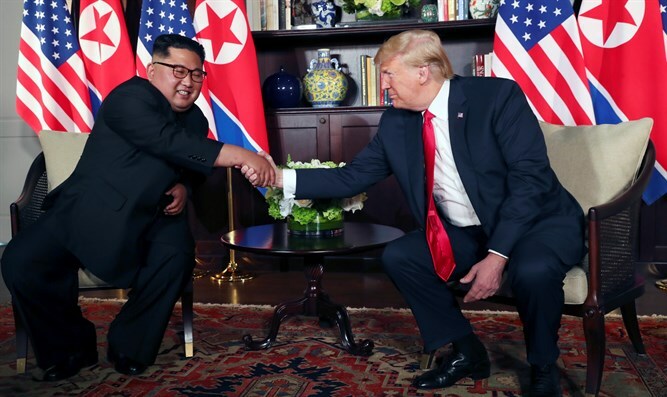 At the signing ceremony, Trump said the two leaders had agreed to sign a “comprehensive document,” promising to discuss the terms of the agreement more in depth at a press conference later on Tuesday. The North Korean leader called the agreement a “historic document”, and said the world would see a “major change” following its signing. "Today we had a historic meeting, and we have decided to leave the past behind and we are about to sign a historic document," said Kim. "The world will see a major change. I would like to express my gratitude to President Trump for making this meeting happen." “I want to thank Chairman Kim. We spent a lot of time together today - intensive time. And I would actually say that it worked out for both of us better than anybody could have expected.... I would say far better than anyone predicted." Before their 45-minute meeting, the two shook hands at the entrance to the Capella Hotel in Sentosa. In brief comments to reporters before the one-on-one meeting, Trump said he believed the meeting will be a "tremendous success". "It's my honor. We will have a terrific relationship, no doubt," he added. Kim said, “It was not easy to get here....There were obstacles but we overcame them to be here." Trump announced last Friday that his meeting with the North Korean leader will take place as scheduled after previously calling off the summit while citing Pyongyang’s “open hostility” towards the U.S. in recent statements. According to North Korean media, Kim and Trump will discuss a “permanent and durable peace-keeping mechanism” on the Korean Peninsula, denuclearization of the Korean peninsula and other issues of mutual concern.